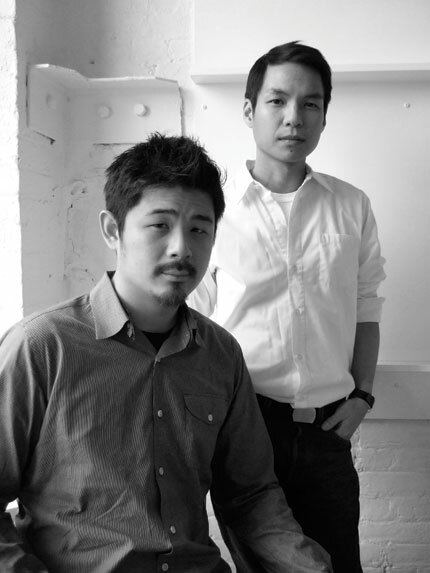 Aric Chen and Tobias Wong are the creative directors of the first 100% Design Shanghai, June 26-28, at the Shanghai Exhibition Center. The Architect’s Newspaper: You were last heard from running a tattoo parlor at Design/Miami. Is participating in an international design fair going to be a big stretch? Aric Chen: Well, because this is the first international contemporary design fair that we know of in China, it seemed that it couldn’t be just any fair. There had to be some kind of underlying premise not only because it’s the first one, but more significantly, because contemporary design in China really doesn’t exist as we know it here and in Europe. In fact, I think that’s why the organizers wanted to involve us, and especially Tobias, because he’s known not so much as a conventional designer of products but as a provocateur. And I think they realized that the fair had to be a little bit more of a statement than just a showcase of interesting designs. What do you mean by no contemporary design when “made in China” is printed on so many products in our stores? Tobias Wong: When I first arrived, what I thought of as original, indigenous Chinese design just wasn’t there. What I did see, from interiors to products, were really western-influenced goods. AC: In January 2007, I was in China working on a story for Fast Company magazine about creativity in graphic design, architecture, product design, and so on. I spent two weeks traversing the country, and I found only two really creative product designers. I assumed that I just hadn’t looked hard enough. Recently, I saw the Victoria & Albert Museum catalogue for a show covering design in China, and they have the same two as their featured product designers. So that seemed to confirm that there really isn’t much. There’s no real infrastructure to speak of, although, oddly enough, there are hundreds of design schools—some quite good, like the Central Academy of Fine Arts in Beijing—literally turning out thousands of graduates each year. Still, I can’t seem to figure out what they’re doing after graduation. TW: We did find some signs of a changing scene, and they’ll be seen at the fair. Lyndon Neri and Rossana Hu own a store in Shanghai called Design Republic that’s very cool. It’s like the Moss of Shanghai. AC: But they also design themselves, and one of the great pieces they have is this double-walled glass vessel. It’s a smart, updated take on the Chinese teacup, and one of the favorite pieces we found that does something new with a traditional concept. I see them as part of a wave of overseas Chinese who are making a big difference in China. Rossana is from Chicago and Lyndon studied at Harvard, and they both worked for Michael Graves in Shanghai. And what are your plans for the exhibition? I understand the hall will be filled with about 100 exhibitors, with some familiar names from Italy and the United States like Cassina and Formica. How will it all hang together? AC: You have to remember how vastly different China was even five years ago. When we first started, we kept talking about the obvious clichés that are in use there—the dragons, the phoenixes—meaning that that would be the last thing you would ever do. But the more we started talking about it, the more we wanted to use something that was local and familiar. So we’re doing this big installation of raw bamboo scaffolding, a platform, if you will, for the years to come. 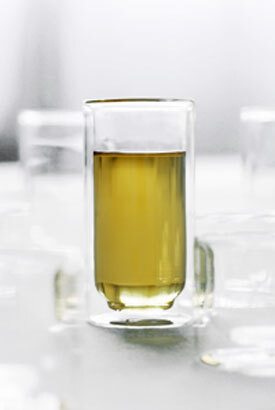 The double-walled Boli glass from Design Republic in Shanghai. TW: Yeah, bamboo scaffolding is a very prevalent thing that you see absolutely everywhere in China now, and it’s become a widely appropriated sort of symbol about the country’s breakneck development. AC: And so we thought we would invert this idea of the bamboo scaffolding so it’s not about structures rising but rather like a void to be filled. 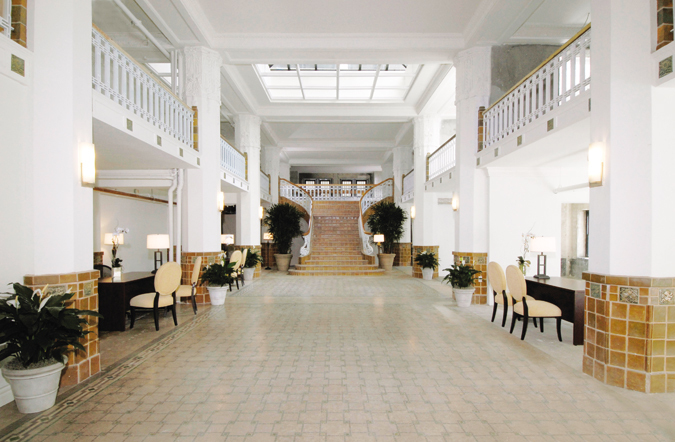 The venue is this fantastic Soviet-built complex—it’s very grand and quite ornamental—from around the 1950s, and inside the entry hall will be empty but for the floor-to-ceiling scaffolding. It becomes a kind of trope for the emerging nature of contemporary Chinese design. WOKmedia from London and Shanghai will be creating an installation with these large glass pieces—like lenses or eyeballs—fabricated locally and scattered in the scaffolding as it continues outside. We’re also commissioning some large sculptures for a café. We want it to be a fun and inspiring collaboration with other artists and designers. AC: In the past, fairs—say, the 1925 Paris Exhibition or the 1893 World’s Fair in Chicago—played a huge role in the development of design. We can’t compare this to that, but it would be nice if 100% Design Shanghai went down as an influential moment in the development of contemporary Chinese design. 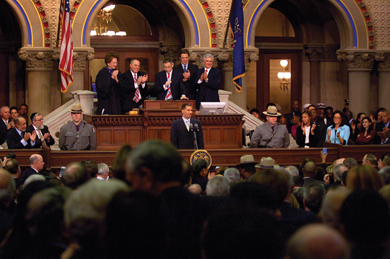 New York governors often build their legacies. Peter Stuyvesant established New Amsterdam, creating the foundation for modern-day New York. DeWitt Clinton opened the west via the Erie Canal. Al Smith ushered in the skyscraper age with the Empire State Building, and Nelson Rockefeller was master of the superblock. How New York’s 55th governor, David A. Paterson, joins the ranks of these builder-governors remains to be seen, especially given his relatively low profile on issues of development and infrastructure. Paterson’s first challenge, after negotiating the budget due April 1 that will determine much of his agenda, will be addressing the ongoing projects of his immediate predecessors. Two of George Pataki’s major New York City projects—the World Trade Center and Atlantic Yards—are plagued by delays and political wrangling. Others, particularly those on Manhattan’s West Side, were still-born, and this was largely where Eliot Spitzer had begun to focus his energies. Paterson surprised many when he threw his support behind New York City’s congestion pricing proposal on March 21, following a closed-door meeting with Mayor Michael R. Bloomberg. The governor’s move bolstered the prospects of the all but moribund pricing plan, whose passage still requires the blessing of state and city officials. MTA director Elliot Sander told AN that passing congestion pricing was the authority’s first priority, which would then pave the way for the capital projects. During his 22 years in public office, Paterson has had a hand in a number of projects, primarily in his home district of Harlem, and these shed some light on how he may approach the public realm. In the early 1990s, while still an obscure state senator best known for his famous father Basil, also a former state senator, Paterson took a stand against two major projects, which showed his concern for the city’s deep African-American roots. The first involved Columbia University’s plans to replace the Audubon Ballroom where Malcolm X was assassinated with a biomedical facility; the school eventually won out, but only after agreeing to preserve almost half of the ballroom. 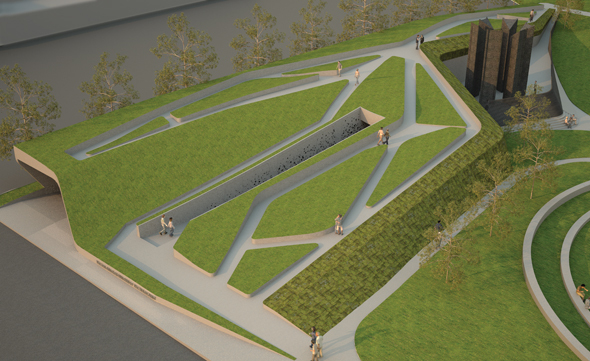 The second concerned a new federal building on the site of a colonial-era burial ground for thousands of African Americans, both free and enslaved. The federal government wanted to rush the excavation of the bones, saying it would cost millions of dollars to perform an extensive dig. Paterson held his ground, and not only were more than 400 bodies recovered, they were reinterred at an on-site memorial that opened last year. Rodney Leon, who designed the memorial, said without Paterson’s efforts, many New Yorkers would be blind to that historical moment. The governor has not always been the staunchest preservationist. During the Audubon fight, Paterson founded a group called Landmarks Harlem, but the man he installed in 1995 to grow the group, Paul Brock, eventually bilked it of much of its funds, leading to its collapse. He also pushed for the creation of a school in a former nightclub and a minimum security prison for women in a row of brownstones, both of which preservationists opposed. As lieutenant governor, Paterson was put in charge of a $1 billion upstate economic development package and a $1 billion stem cell research program, which he had championed in the legislature. Forget the red car era, in which public transportation was seen as unglamorous and irrelevant to Los Angeles life. In 2008, public transport projects crowd the region like sorority girls vying to be Pasadena’s Rose Queen. In January another hopeful, a high-speed intra-regional transportation system designed to link a necklace of Southern California airports and ports, transitioned from planning to implementation phase when the LA City Council approved a joint-government authority to oversee the development of its initial operating segment (IOS). The authority will supervise and approve route selection, the Environmental Impact Review (EIR), financing, land acquisition, bids, and construction on a proposed route linking Los Angeles to the Ontario Airport. If funded and built as currently conceptualized, the entire system would be completed by 2030, move at speeds of up to 300 miles per hour, and provide transportation for up to 500,000 riders a day. Los Angeles City Councilman Greig Smith characterized the step as “a giant leap” from a planning process more than seven years in the making. Smith represents the council on The Southern California Association of Governments (SCAG), which initiated the project and has carried it through preliminary planning. The first segment of the system is slated to have stations in West Los Angeles, Union Station, West Covina, and the Ontario Airport. According to Smith, an LAX station was also suggested for the route by SCAG’s board about six months ago. SCAG has commissioned conceptual plans from land use and transportation consulting company IBI Group, but the official design phase for the IOS could be more than a year away and would be contingent on funding. Rather than occupy city streets or require underground tunneling, the transit system would piggyback onto Los Angeles freeways. Caltrans participated in the planning stages and has bought into the concept of the project. A study by SCAG staff will be completed this June to help the authority decide on routes and technologies. The document will provide comparisons between the I-10, SCAG’s preferred alignment, and a newer alternative on property owned by the Union Pacific Southern Route that runs parallel to State Route 60. Transportation systems being considered include a high-speed steel wheel system, such as Japan’s bullet train, or Maglev, which harnesses advanced magnetic levitation technology and an elevated monorail. The latter was favored throughout much of SCAG’s project evaluations, but SCAG currently holds a technology-neutral position. Smith, however, touted Maglev for its lower construction and maintenance costs and lower pollution levels. Maglev does have one drawback, though. There are few long term data demonstrating proven success. In China, Shanghai boasts the only operating Maglev system in the world. Bullet trains, which have a lengthier track record, have positive safety records. 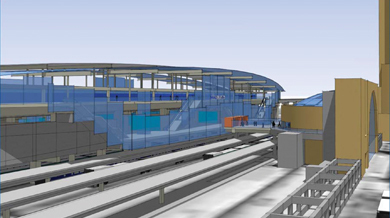 IBI Group oversaw SCAG’s initial planning process and developed conceptual designs for four Maglev stations. 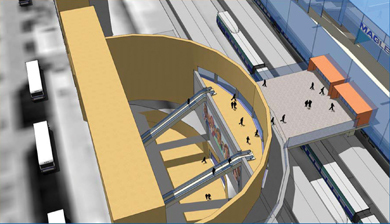 Their work will provide a reference point for architects designing the stations in the future. “The aesthetic features of the stations are intended to reflect the intrinsic values of the Maglev system: advanced technology, movement, and speed,” the IBI Group stated in a report to SCAG. Their sleek, often-curved conceptual designs contrast cast-in-place concrete cores with glass and polycarbonate walls leveraging natural light and ventilation through open air stations to take advantage of the region’s climate. Louvers or perforated metal screens provide shading. Connections to other forms of transportation like light rail, bus, air, and automobile were emphasized. While the conceptualized stations share a visual identity, each addresses individual site considerations. At West Los Angeles, IBI’s challenge was to conceive of a station that could meet the system’s taxing demands but also retain the modest scale required to integrate with the residential community. At Union Station, the firm created space for a new mode of travel in an already packed and historic site by elevating a Maglev station above existing rail. In West Covina, the station is built into a mall—the result of SCAG successfully reaching out to the retail complex’s operator, said David Chow, director at IBI. As with the myriad of transportation projects in development across the region, the elephant in the room is cost. A 2005 estimate by IBI predicted the project could cost up to $7.8 billion, a figure that would be higher with current market prices. Funding-wise, the system would not be “a government subsidized project,” but rather a public-private partnership developed to supply funding, councilman Smith asserted. A new player on the Maglev scene, American Maglev of Marietta, Georgia, has offered an unsolicited bid, proposing to provide free construction if the first route is revised to include the port of San Pedro. In this case, fees charged to cargo transportation would finance the rest of the endeavor. But American Maglev does not yet hold a track record of successful projects. Architects coast to coast are murmuring about a tower proposed in February for Seattle by Portland-based Zimmer Gunsul Frasca that bears more than a passing resemblance to Robert A. M. Stern’s Tour Carpe Diem announced in January in Paris. The glass towers both feature double-take-inducing faceted facades of triangular planes that angle in and out. While we cross-referenced the employee contact lists of each firm to find out which disgruntled architect lifted the blueprints along with his walking papers, several responses to an ArchNewsNow.com newsletter reveal that there are actually several more angles to the story. Keen eyes saw similar angles in Dallas’ Fountain Place byHenry Cobb of I.M. Pei & Partners (1986), I.M. Pei’s Bank of China Tower (1990), Lab Architecture Studio/Bate Smart‘s Federation Square, Melbourne (2002), even in the under-construction Bank of America Tower by Cook + Foxin Manhattan. Wow, we had no idea that architects were so… multi-faceted. When we got word that SBE Entertainment Group (owners of trendy LA restaurants, clubs, and other real estate) CEO Sam Nazarian was named to SCI-Arc’s board of directors last month, we only had one question: How long until Spencer Pratt goes back to school for his masters in architecture? Let us explain. SBE’s got a recurring gig on the is-it-real-or-is-it-fake docudrama The Hills (it’s fake), one of the hottest shows on television, since star Heidi Montag“works” there. Watch closely (because you know you want to) and you’ll notice SBE-affiliated institutions like the Philippe Starck-designed Katsuya fleet seem to appear on-screen a little more frequently than other LA locations. Therefore, it’s only logical that next season will see a fascinating plot twist that results in a scantily-clad catfight in SCI-Arc’s parking lot. Or Nazarian could help out the unemployed Lauren Conrad, who left her “job” at Teen Vogue at the end of last season. Maybe there’s an opening in the SCI-Arc publications department? SEND TIPS, GOSSIP, AND PARTY SOUVENIRS TOSLUBELL@ARCHPAPER.COM. Cover your ears, Jane Jacobs. On February 12, the Landmarks Preservation Commission (LPC) voted unanimously to calendar a public hearing on a Robert Moses–era slum clearance project known as the Silver Towers. The vote is a step toward victory for efforts to save one of New York’s precious postwar landscapes. But neighbors fear this tower-in-the-park could be sorely cramped by New York University (NYU), which is scouring the area for millions of square feet to accommodate planned campus expansion. 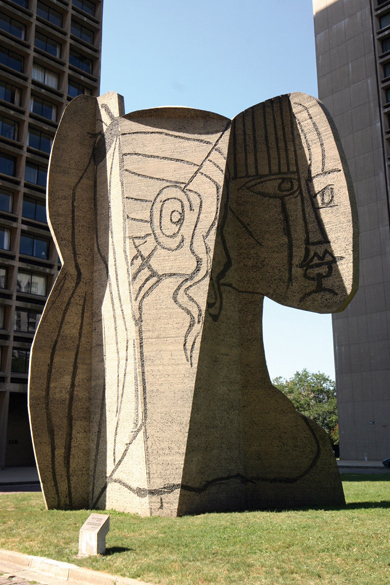 With a central courtyard dominated by the 36-foot-high sculpture Portrait of Sylvette, executed from a Picasso design, the Silver Towers are an unusually urbane case of urban renewal. 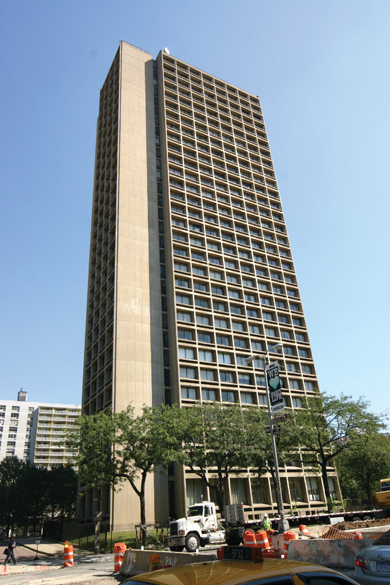 Designed by I. M. Pei & Partners and completed in 1966, three concrete towers sit on a five-and-a-half-acre superblock between Bleecker and Houston streets. NYU acquired the property in 1963 and hired Pei to design two towers to house university faculty and a third tower that is ground-leased to residents of a Mitchell-Lama cooperative housing project. Built of cast-in-place concrete with deeply set windows, the towers pinwheel in plan, shifting on axis to break up what could have been a fortresslike slab into slender shafts that are deferential to the landscape—despite a Houston Street frontage that turns a cold shoulder to Soho. “In spite of its flaws, there is so much about this design that is thoughtful and sensitive and innovative in a way that too few of its peers were,” said Andrew Berman, executive director of the Greenwich Village Society for Historic Preservation, which has been pressing for designation since 2003. “In some ways this is the exception that proves the rule.” Admirers cite stylish architecture under budget constraints (all three buildings met city cost-per-square-foot mandates) and particularly welcome designation since an earlier New York project by Pei, Kips Bay Plaza, has been marred by a cinema shoehorned onto the site. The Silver Towers debate unfolds against the university’s Brobdingnagian plans to add 6,000,000 square feet over the next 25 years. At a January 30 open house, NYU released the first concepts from a team led by design firm SMWM with Grimshaw, Toshiko Mori Architect, and Olin Partnership, who must orchestrate a high-stakes urban chess game to allocate new space among NYU’s core campus and outposts elsewhere in the city. With few parcels left in the West Village, designers have targeted the Silver Towers block and, to the north, the apartment slabs known as Washington Square Village. With their generous open spaces, those blocks could add 2,500,000 square feet above and below grade, inviting scenarios such as razing Washington Square Village and restoring the street grid to that superblock. Near the Silver Towers, concepts include building at the Coles gym and supermarket sites, and even atop Alan Sonfist’s Time Landscape, a quirky miniforest evoking Manhattan’s precolonial flora. With a landmarks hearing expected in the coming months, designers have a delicate task ahead. 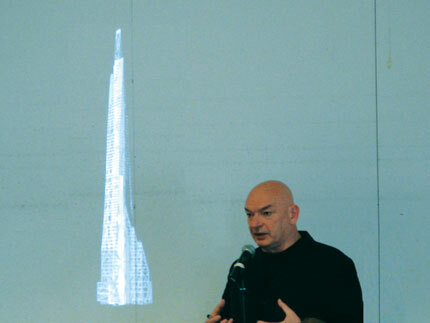 “The question remains: What is the best way to take advantage of the available square footage on that block in a way that’s respectful of those towers and their potential landmark status?” said Jack Robbins, studio director in SMWM’s New York office, who added that the team is studying options to one of the community’s least-liked scenarios, a tall building at the supermarket site. “I think we all believe there are potentially better solutions in terms of the design and the politics of the community relations,” he said. If being chosen as part of the Emerging Voices series is a coming-of-age mark for small firms, P.S.1’s Young Architects Program has become another, with the added benefit of a summer’s worth of DJs and beer. Each spring, the museum chooses a firm to build a temporary installation in the courtyard that can accommodate its Saturday series, Warm Up, essentially a hip block party. WORK AC’s Public Farm 1 got the nod this year for a proposal that brings sustainable agriculture back to the city. 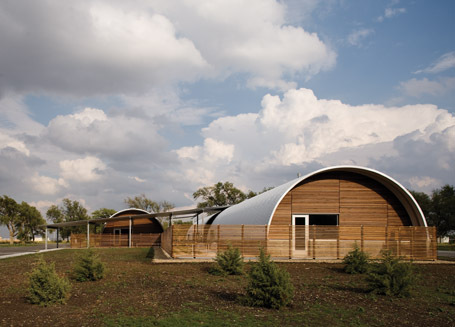 A sloping structure made of cardboard tubes (left and bottom left) will incorporate planters with flowers and vegetables for harvest, rainwater basins for crop irrigation, and solar panels for cell-phone-charging stations and the like in the shade below. According to principals Amale Andraos and Dan Wood, they have details to work out, but that is in keeping with the spirit of the series: With its short time frame and modest $70,000 budget, each year’s winner has a chance for on-the-fly experimenting. The issues WORK is grappling with at P.S.1 are ones that Andraos and Wood have been thinking about for a while. 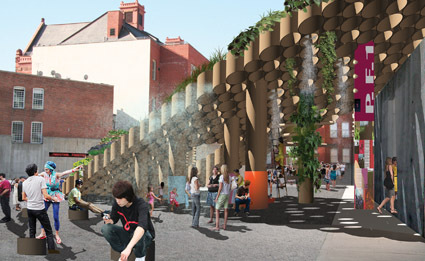 In particular, they are concerned with finding new ways to bring ecologically minded design to an urban level. “For us, it is more than a formal experiment,” explained Andraos, “it is a reflection of what is going on around us,” from the citywide popularity of farmer’s markets to the mayor’s PLANYC 2030 campaign to make New York more green. They have clearly hit on something, because in the first 24 hours after their selection was announced, Woods said they received hundreds of emails, including many that weren’t from architects. There was a man who has been running a farm in Queens, a high school teacher who has incorporated agriculture into the curriculum, and even staffers at the local botanical gardens. “It is as if we stumbled onto a whole network of people who are interested in this issue and what we are doing,” said Wood. Though all of the big breweries in Milwaukee are gone except for Miller, beer and its production marked the city indelibly, according to Sebastian Schmaling. “The old beer barons were often great patrons of the arts, and there are wonderful old bars downtown that have amazingly detailed interiors,” he said. 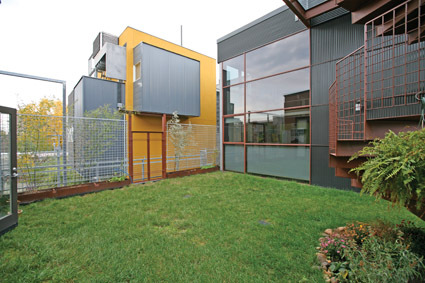 In fact, his five-year-old firm, Johnsen Schmaling Architects, has made its office in one of them. One of the firm’s larger residential projects is a renovation of an old Blatz brewery building into apartments. In a subtle reference to the building’s past, the architects created screens in the lobby that hold 1,600 of the original old Blatz bottles that they found stored in the building’s basement. The panels pivot into place to separate the lounge from the main entrance, and light washes down to illuminate the amber glass (below, left and right) “We didn’t want to bring it to a frat-boy level of humor, of course, and the bottles are the only reference, but it is part of the cultural history here,” said Schmaling. The use of the bottles is also indicative of the way that Schmaling and partner Tim Johnsen think about context, and how they bring it into their work. 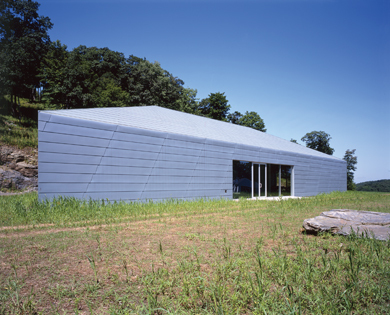 “Context is an overused word,” said Schmaling, “but if you can read a site more poetically and less literally, you can develop a language that guides you through the project.” Another building that takes this approach is the Camouflage House in Green Lake, Wisconsin (above). “We were lucky to be able to spend a lot of time on the site, even camping out on weekends, and began to look at the verticality of the trees, the patterns of bark, and the colors through the seasons,” Schmaling said. The finished house echoes the solid-and-void pattern that one gets when looking through trees to the water, rooting the house to its site in the woods. development arm called Onion Flats, a design practice called Plumb Bob, and a contracting and construction management firm called Jig. The three are intimately connected, allowing McDonald and his partners (two of whom are his brothers) to rethink the way they work. “Typically, a drawing set has to define 100 percent of a project, but we want our building sites to be creative places, so we have often kept ours smaller, making seven drawings as opposed to 30,” he said. McDonald explained that this lets the team respond with agility to the facts on site, which are rarely identical to those on paper. Think, for a moment, about how many architecture jokes you know, even ones involving severe black eyeglasses. There aren’t many, and for good reason: As a group, architects typically take themselves seriously. Not so Dan Maginn and his partners at el dorado, a Kansas City–based design and fabrication firm. “There is nothing less funny than a building that tries to explore humor,” he said, “but there is nothing funnier than a group of people trying to do something in an environment that isn’t set up for it.” Architecture is a tough business, said Maginn, and if you can’t hang on to some humor and humility, it’s not worth it. 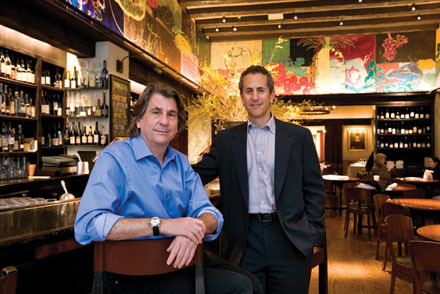 Maginn and his partners have set up their firm to make sure they can do just that. full metal shop in the studio, and this allows the architects to test and prototype details before going on-site. “We have a lot of respect for good contractors, and as fabricators, we can form a relationship with them that is really helpful for the project,” he said. It also means that el dorado can use prefabricated elements to stay within budget, as it did for the Cox Communications (top right) and the Hodgdon Power offices (bottom right), both in Kansas. When the architect Michael Meredith got a fellowship at the Chinati Foundation in Marfa, Texas, about ten years ago, the work he produced there was somewhat off the beaten architectural path: He designed a series of cushions for Donald Judd’s beautiful but ungiving furniture and wrote a series of theme songs for some friends. Nonetheless, Meredith said that much of the work he and his partner Hilary Sample are working on today has its roots back in Texas. “A lot of it comes from the people we met there,” said Meredith, like the Ancram Studio in Upstate New York (below). “The art world has been good to us,” said Meredith. Some work comes over the transom, though not always in the standard way. A wrong number led to one MOS project that is tethered to the shore of Lake Huron in Vancouver (above). 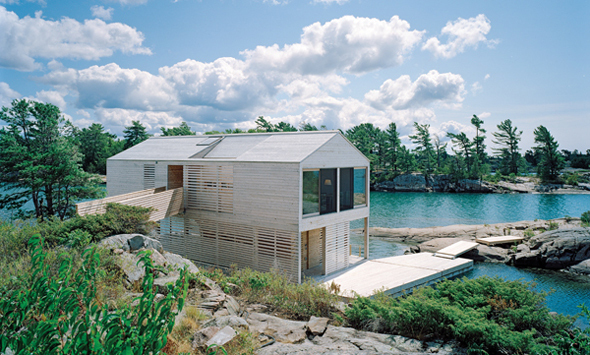 Designed for a couple, the house floats a few feet from the water’s edge on massive steel pontoons that can also be used as ballast when partially filled with water. Flexible couplings for utilities and waste allow the house to rise and fall with the lake level, which can fluctuate dramatically over the course of a year. “Climate change has really affected Lake Huron,” said Meredith. 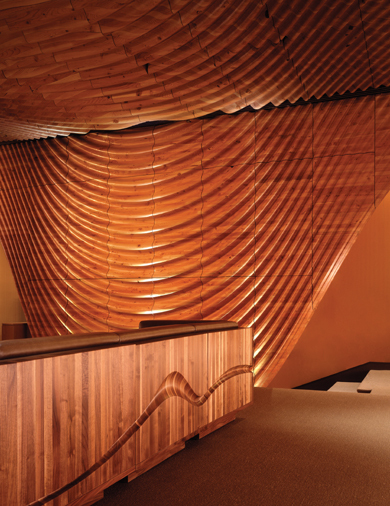 Hagy Belzberg’s big break came when his firm was commissioned to do a 12,000-square-foot interior at Frank Gehry’s Walt Disney Concert Hall in Los Angeles. The building was widely praised by the press, and Belzberg got a share of it for his warm and curvilinear wooden interiors (left). But just as important as the exposure was the sense of possibility it opened: “It gave us the confidence to pursue more complicated forms,” said Belzberg. A stoss is a geological term describing the side of a landscape that has borne the brunt of a glacier’s force, and it comes from the German word for “push.” There are ruder translations, too, according to principal Chris Reed, and while he wasn’t aware of them when he launched Stoss Landscape Urbanism eight years ago, the mix makes sense. 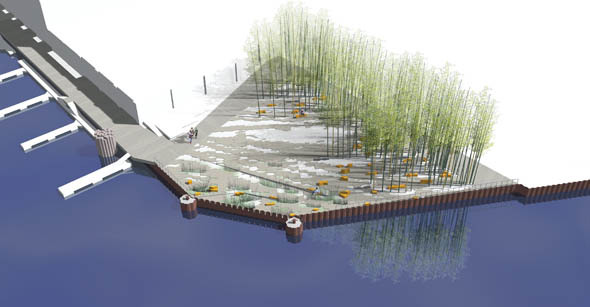 Reed described his firm’s approach to the design of landscapes large and small as inventive about a place’s nature and willing to bring flexibility into urban spaces. So why not have that in a name, too? A playground in Quebec called the Safe Zone (top right) makes good on that approach. 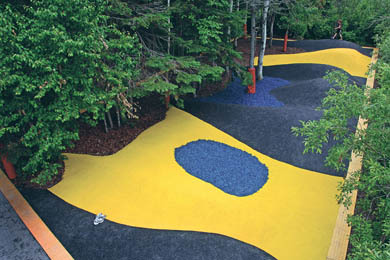 The brownfield site needed to be sealed off for safety, so Stoss designed a series of mounds covered in soft rubber pips made out of sneaker soles and old tires, creating a brightly colored landscape that doesn’t dictate how the kids who play there will use it. 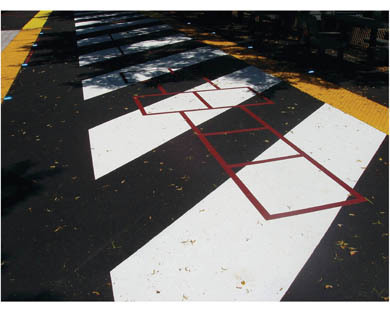 For Perkins Park in Somerville, Massachusetts, (bottom right) Reed described watching the way his own children horse around and make use of whatever catches their eye, and so he incorporated a series of overlaid patterns and colors into the design that don’t dictate what the game should be. “We wanted to provide a full palette of colors and textures and forms to give a sense of free play,” said Reed. The same sensibility informs larger projects like the Erie Street Plaza in Green Bay, Wisconsin (top), albeit in a more adult way. “Sometimes you have to let the environmental conditions or bureaucratic conditions determine the way a project evolves over time,” he said. The Fox Riverfront in Dennis, Massachusetts is perhaps the most representative of this ethos: Reed described a landscape whose different parts will essentially duke it out over the years. Four conditions—salt marsh, cedar meadow, junegrass, and a filtration meadow—will grow or shrink as drought or municipal maintenance budgets allow. “If the town can’t afford to mow, then perhaps the cedars will grow into the junegrass, or if there is heavy rainfall, then perhaps the salt marsh will expand.” Either way, Stoss is willing to let it play out. According to the Moorheads, who have worked together for eight years, they try to approach each project—be it the residential compound in Uruguay they are just completing or the rubber lamp they designed for the 2002 Skin show at the Cooper-Hewitt—with the understanding of both those scales at once. 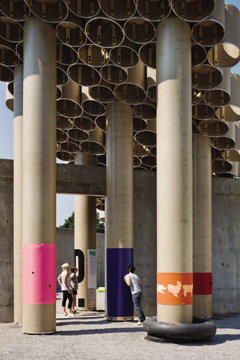 Last year, they worked with their father (also an architect) on a project in North Dakota, where they grew up, that is part public art installation, part architecture. A local artist commissioned six designers to make small spaces for reflection and art that would be mobile so that many more people could use them. Their solution was to use thermal plastic rods much like the struts of a tent set into a rigid bench that is both seating and structure. 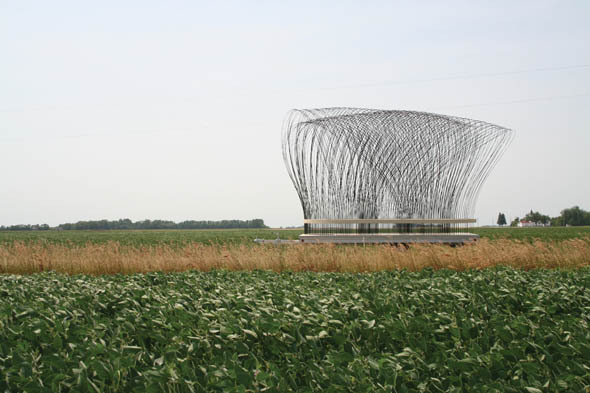 The result (above) suggests something between an open-air chapel and the frame of a covered wagon, and is a compelling synthesis of the two brothers’ respective disciplines. 7:00 p.m., with the exception of the March 5 lecture, which will begin at 6:45 p.m. Lectures will be held at the New Museum, 235 Bowery. Although it hasn’t gotten much attention, another firm besides Renzo Piano Building Workshop is working on a major commission at the LA County Museum of Art (LACMA). Culver City-based SPF:A in November finished first schematic designs for the renovation and transformation of LACMA’s May Company Building, just west of Piano’s almost-completed (and just snubbed by its namesake) Broad Contemporary Art Museum. The May building, known as LACMA West, now contains small exhibition spaces, offices, and warehouse-like storage. Many of its windows are boarded up. It will be transformed into a major exhibition space containing much of LACMA’s contemporary art collection, as well as a restaurant, book shop, and special event spaces. The firm was commissioned for the project in August. The five-story streamline moderne building at 6067 Wilshire was designed as a May Company department store by AC Martin and Samuel Marx in 1939. 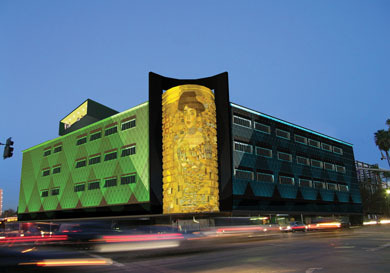 The structure’s most recognizable element is the cylindrical, gold-colored tower and deco signage on its northwest side. LACMA purchased the property in 1991, opening it for exhibitions in 1999. SPF:A will keep the facade intact, repairing and replacing worn-out elements and bringing the building to code. The northeast corner will be changed to accommodate a “signature” display, although that element has not been worked out, explained SPF:A partner Zoltan Pali. Inside, the firm will open up once chopped-up spaces, creating open-plan gallery and work spaces, and using a minimal palette meant to defer to the artwork. The mezzanine, now boarded up, will be opened and connected to the entry to create a dramatic, double-height public space. The third and fourth floors will be used for offices, and the top floor will include a boardroom and outdoor gathering and exhibition spaces. The project will be completed in 2010, and fundraising is in full swing. We are recovered, at last, from the haze of the holidays, though still haunted by the memory of Steven Holl’s office party: Did the slideshow projected on the wall really show the man in question shirtless? At the time, we asked him, and he mentioned something about being a young architect, just getting started, etc. Footloose and garment-free, eh? But we digress… In the spirit of self-sacrifice for which we are widely unknown, we dispatched ourselves over to Madison Square Park the other day to test out the Nicholas Grimshaw–designed pissoirthat has caused so much twittering since it was installed in mid-January. (Admittedly, there was some self-interest involved, as we are cursed with what could be described as the bladder of a third-grader, and—happier thought!—the Shake Shack, to whose burgers we are very partial, is right nearby.) So, Gentle Reader, off we went! As we waited for the man in front of us to, ahem, take care of business, we spotted a CEMUSA truck parked on the curb, and a young man in a CEMUSA jumpsuit leaning up against it, undoubtedly to watch his employer’s snazzy new toilet. (For those oddities among you who are not fascinated by the sanitary habits of New Yorkers, CEMUSA is the Spanish company producing these miraculous cabins of comfort.) Channeling our inner Brenda Starr, we smiled broadly and asked how it was being received. Our charming young informant told us all about it and said it’s a hit: “The men, the ladies, they all love it. But especially the ladies, who like how clean it is.” We agreed that clean is good and continued to chat away when, suddenly, the young man blurted out, “FINALLY! You can pee in style!” Were the cabin door not opening, and our turn arriving at last, we would have cheered because we couldn’t agree more: We pride ourselves on doing everything in style. Robert A. M. Stern may have already gotten the commission to design theGeorge W. Bush Presidential Library, but some folks apparently think he could use some help: The Chronicle of Higher Education is holding a competition to deliver Stern a wealth of ideas. Standard architecture contest rules apply, with one catch: Your entire concept must fit on the back of an envelope. (Insert your own joke here; we made ourselves delete it.) Readers will vote on the best design, the winning designer will get an iPod Touch, and the architecture world will earn the undying admiration of the Republican Party. Deadline is February 1, for details and to vote, visit chronicle.com/indepth/architecture/architecture-contest.htm. Looking at the corner of Flatbush and Dekalb avenues in Brooklyn, it would be hard to tell that the area was once an agricultural center, but a new garden at Long Island University’s (LIU) downtown campus is serving as a reminder that many things can grow in Brooklyn. The New York–based firm Alec Klee Galli Architects was commissioned last year to transform part of LIU’s urban campus into something more pastoral. “The space was so grim before, all concrete,” said Joanna Marx, an archivist at LIU. “Now, it has a fanciful quality, like Alice in Wonderland going down the rabbit hole and re-emerging into a new world.” This foray into landscape architecture was a first for principal Alex Galli, who came on board after his friend Stuart Fishelson, a professor of photography at the school, recommended him to provost Gale Steven Haynes. “Everyone was longing for lawns,” remarked Galli, “so I wanted to get in as much green space as possible while emphasizing principles of geometry.” Straight and rounded paths are metaphoric representations of the disciplines taught at the school, and create beds of dogwoods and purple lilacs around three fountains. Galli worked closely with the Brooklyn Botanic Garden in locating over 1,000 native plants to create a space that acts as homage to old New York’s landscape. Another area full of berry bushes, azaleas, and plum trees is known as the Garden of Eden and was inspired by early accounts Galli read about Brooklyn in the 1600s. “I thought it would be neat to have actual fruit-bearing plants on a campus in downtown Brooklyn,” says Galli. Along the streets, there are beds of wildflowers, dandelions, clovers, and mosses designed to resemble country meadows. 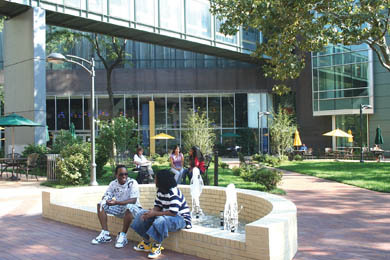 The garden is attracting more applicants to the university, according to public relations director Peg Byron, and has fostered a communal sentiment among LIU students, many of whom have not experienced the “traditional campus feel” enjoyed by students attending college in non-urban areas. The project is still only half done. Another section between the Health Sciences Center and the Pharmacy School, on hold until spring, will feature medicinal plants. When complete, the Brooklyn campus will have 30,750 square feet of green space. “Gale’s dream is to make this a downtown oasis,” said Galli. When Philadelphia’s manufacturing base abandoned the city shortly after World War II, it left behind a 7-mile stretch of prime waterfront real estate along the bank of the Delaware River. For the next 50 years that land lay fallow, cut off from the rest of the city by I-95, home to crumbling industrial structures, an underused pedestrian area, and two big-box retailers that showed up in the 1990s: Wal Mart and Ikea. But in recent years the waterfront has been the focus of a flurry of speculative development from which two visions of the area’s future have arisen: In one—the collective scheme of a handful of private developers—the waterfront becomes home to more than 20 highrise condominiums situated on megablocks. In the other—a proposal soon to be finalized by PennPraxis, the non-profit consulting arm of the University of Pennsylvania’s School of William Penn’s Design—famed street grid extends to the river’s edge, creating the template for a pedestrian-scaled, mixed-use urban environment. Though inherently at odds, the two visions haven’t squared off for a proper battle for supremacy until now. On November 14, Praxis’s proposal will be displayed to the public at the Pennsylvania Convention Center. If all goes well, its recommendations could be voted into law within the next year. The imminence of this plan has drawn the ire of heavyweight zoning lawyer Michael Sklaroff and former city planning commissioner Craig Schelter, who now represents the waterfront developers. Both Sklaroff and Schelter have blasted Praxis for not taking the developers’ input into consideration. But this complaint is an empty one, said Praxis director Harris Steinberg, who added that the entire process has been open to the public. “The development community could have put in their two cents at any time,” he explained. Initiated on October 12, 2006, in an executive order by Mayor John F. Street, the Central Delaware Riverfront Planning Process materialized from a measure put forth by city councilman Frank DiCicco. The move was a response to public outcry over two casinos that the state legislature had allowed on the riverfront in a piece of midnight rulemaking. Steinberg and Praxis agreed to take on the project under one condition: that the process be completely transparent and open to community involvement. 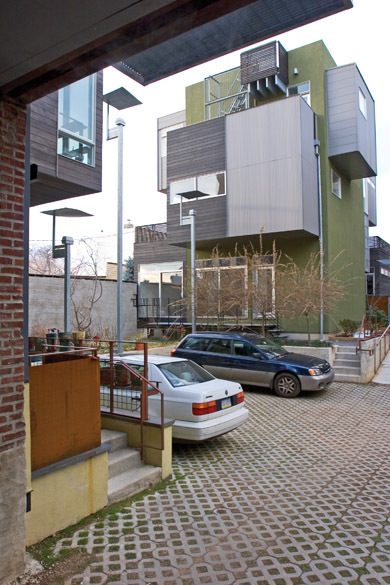 Working with design firm Wallace, Roberts, and Todd and the Philadelphia City Planning Commission, as well as a handful of other consultants, Praxis attracted more than 4,000 Philadelphia residents to 13 public events. The plan that has emerged from that yearlong process reportedly draws on the city’s powers to impose civic guidelines on developers. For example, the city has the power to plat streets, or force developers to adhere to the master plan’s grid when developing their properties. The biggest impediment to the Praxis plan at this point is Sklaroff, who, according to Steinberg, has the ear of the governor, operates via backroom deals, and could influence the new mayor (the office is up for reelection). On the other hand, considering the nation’s softening real estate market, the riverfront could lay fallow for another 50 years.